This winter, the Reader has set a humble goal for itself: to determine the Greatest Chicago Book Ever Written. We chose 16 books that reflected the wide range of books that have come out of Chicago and the wide range of people who live here and assembled them into an NCAA-style bracket. Then we recruited a crack team of writers, editors, booksellers, and scholars as well as a few Reader staffers to judge each bout. The results of each contest will be published every Monday, along with an essay by each judge explaining his or her choice. The Reader reader who best predicts the judges' rulings will win a trip to Mexico. 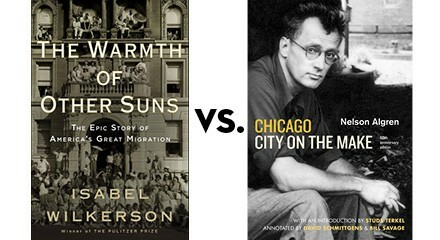 In this week's contest, the first bout in our final four, Reader digital content editor Tal Rosenberg faces a tough choice: The Warmth of Other Suns by Isabel Wilkerson vs. Chicago: City on the Make by Nelson Algren. To see the results of previous bouts, look here. This tournament has featured a broad range of books, from YA to memoir to graphic novels that come in board-game boxes. And yet it's difficult to imagine two books more dissimilar than The Warmth of Other Suns and Chicago: City on the Make. There are some substantial differences between them, such as . . . It took me roughly three days to read The Warmth of Other Suns whereas it took me roughly three hours to read Chicago: City on the Make. Though I prefer short books to long ones, you wouldn't know it from my short list of favorite books, which tend to break the 500-page mark. A long book can be just as satisfying as a quick read and arguably more impressive when it justifies its length. Spending three days reading a book produces a different sense of pleasure than a three-hour read, mostly because the immersion is so much more intense. With literature, different lengths start to blur the lines between formats, similar to the way The Sopranos and The Godfather are both about organized crime and family and are both shot with motion-picture cameras but are technically "television" and "film," respectively. Two books can be about the same subject, but there's an ability to cover more ground and add new dimensions to characters or stories when there's more space to do so. Which brings us to . . . The Warmth of Other Suns is a nonfiction account of southern blacks who migrated to the northern states and the west coast throughout the middle chunk of the 20th century. While Wilkerson mentions her own experiences in the book, her presence is rare and takes a backseat to either the narratives of one of the three main characters or to journalistic, expository reporting. It is long-form journalism with elements of creative nonfiction. Chicago: City on the Make, on the other hand, could conceivably be categorized as "nonfiction," but it's really more of a prose poem or an ode (more so even than a "lyrical essay," which is how it tends to be categorized online), and the emotional effect of poetry is perceptibly different than that of fiction or nonfiction. In my experience, the responses I have to poetry are potent but ephemeral, like looking at a painting, whereas my responses to fiction and nonfiction endure longer because my interaction with them takes more time. Speaking of different perceptions . . .
Chicago: City on the Make extends a compassionate hand to the city's downtrodden, but it celebrates a romantic kind of decrepitude, rooted in bohemia and small-stakes crime: bums, con artists, drifters, and layabouts. The Warmth of Other Suns tells the stories of its protagonists romantically, but it hardly romanticizes their experiences. Injustice and obstacles come fast and frequent, and the mistreatment with which the characters in The Warmth of Other Suns are confronted is shocking and appalling. As you can see, this is hardly a fair fight, but what's interesting is that you can view unfairness from the perspective of either book. Chicago: City on the Make is brief, romantic, and rapturous; The Warmth of Other Suns is immersive, resourceful, and beautifully narrated. Yet for the purposes of this competition, Chicago: City on the Make has one distinct advantage: it's actually about Chicago. After reading The Warmth of Other Suns, I was surprised to find that it even made its way into the competition. Of the three characters, only one, Ida Mae Gladney, has a story that takes place in Chicago, and while Wilkerson uses Gladney's story as a springboard for describing the city's history of racism and segregation, it's not a significant section of the book. It doesn't help that of the three characters, I found Gladney to be the least compelling. I eagerly awaited each section of her story, but not as much as I did the other two characters'. Robert Pershing Foster, who left Louisiana and moved to Los Angeles, where he eventually became Ray Charles's physician, is by far the most engrossing of the three, both for the strength of the narrative and the way the story is told. I'm quibbling, because one thing worth mentioning about The Warmth of Other Suns is that I couldn't put it down. Did I mention that The Warmth of Other Suns is a great book? Like, all-time great. Teach-this-book-in-history-classes-and-nonfiction-MFA-programs great. I was floored by Wilkerson's prose, her structuring of different narratives, and her incorporation of background research and reporting. It's one of the best recent nonfiction books I've read. I was confident that I would choose it to go on to the finals—even if it isn't entirely about Chicago, part of it is, and like Mara Shalhoup in round two, I could justify its winning because of its quality. One for white collars as well as blue, for our museums like cathedrals and our cathedrals like museums, for the windy white-and-blue miles of our beaches, the Saturday night moonlight excursions to Michigan City, the afternoon at the zoo washed into mists of sunlit remembrance by a sudden warm, still rain . . . I was struck by the way that word choice had such powerful resonance, concerning a city where I've spent most of my life, whether viewed through the rose-tinted lenses of youth or the flinty skepticism of adulthood and stationary living. Now I was torn—I didn't know what to pick. I thought back to the Greatest Chicago Book event that was held at Seminary Coop in January. I sat on the panel, and at the time I remarked that one thing I appreciate about this bracket is the way it challenges the conventional thinking of what a "great Chicago book" is, that it allows room for new books and new perspectives. But I was swayed by round one judge Jake Austen, who invoked his own essay in which he said that he could think of nothing more "Chicago" than Studs Terkel, and that he felt he was judging the books based on their "Chicagoness." I thought about what he said and my mind was made up: Chicago: City on the Make it was. But while writing this essay I returned to my earlier line of thinking. Maybe The Warmth of Other Suns isn't a "great Chicago book," but maybe it's what a great Chicago book could be. Could a great Chicago book be one that isn't so explicitly about the city, that doesn't resort to beer-soaked sentimentality to speak to its power? Should we as citizens and as readers reckon with the injustices of this city rather than overshadow them with mythology and folklore that exaggerates the past? Should the greatest Chicago book not be by or about Chicago, but by an outsider who addresses Chicago's problems in oblique and indirect ways, in empirical narratives that are indisputable? Isn't that the Chicago we want, rather than the Chicago we've lived and are living in? I don't know if I have the answers to these questions, but I want my fellow readers to address these questions with me. May they all read The Warmth of Other Suns and decide for themselves. Warmth was definitely the underdog this time around. Check back here next week to see who its opponent in the finals will be. 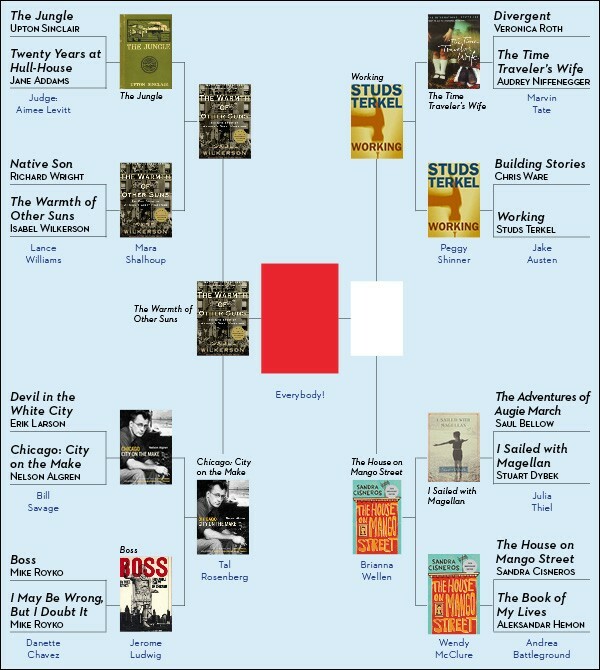 Which book is the greatest—and which reader gets to go to Mexico? How to choose between two books? A judge seeks guidance from Virginia Woolf: "our taste, the nerve of sensation that sends shocks through us, is our chief illuminant." One of these literary heavyweights will have to defeat the other . . . by a nose. In a battle between two heavyweights, is it the greatness or Chicago-ness that matters more? Between now and April, the Reader and its readers will be choosing the greatest book ever written about Chicago.